DAS-VME-6U is the main interface for mostly of our â€œInterface Panelsâ€� I/O solutions. connector P0 (95pins har-bus HM Series ) are normally reserved for the custom I/O signals. 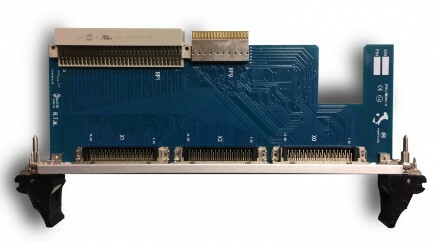 Our VME Interface transiction module allows to interface all the I/0pins of the VME-64/P2 connector (row z-a-c-d) and most of the commonly used pins of VME-64/P0 connector. Because on the market there are several type of â€œsignalsâ€� and hundreds of different VME boards, PMC-modules and I/O interfaces, we have built a selection of â€œInterface Panelsâ€� based on different type of connectors ( push-pull LEMO; D-SUB Harting; and Phoenix contact) that help the users to interface in a very shot time any kind of devices to the VME acquisition boards. It is the best choice for the top quality simulation/test/mesurement in the industrial environments like Avionic, Naval and Automotive.